Having worked on the itas support desk, there are a few queries which are regularly logged everyday. These are simple cases which you, as the customer can solve in a matter of seconds. 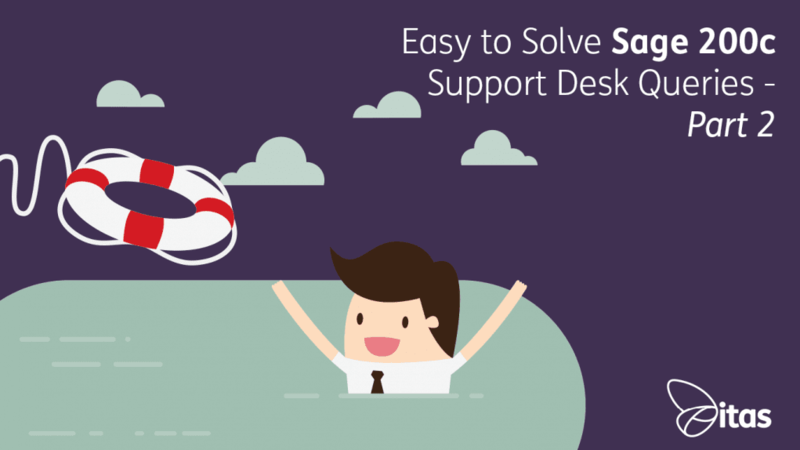 Here are 4 of the most frequent cases I have dealt with during my time on Sage 200c support. If you try to run a report or print an invoice and it does not preview on your screen, it may be due to the output mode you have selected. This can be easily adjusted within the settings of your Sage system. Visit the little cog on the top right of your screen and then select Choose Output Mode. A window will pop up asking where you would like to document to go. The image below displays your options. There are three locations where your documents could be sent to; the printer; the spooler (which is a like a holding bay) and preview, which displays the document before you decide what to do with it. 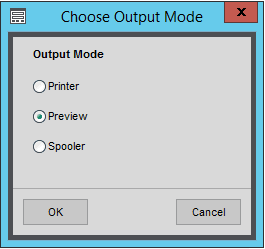 If your documents are not showing after you have selected ‘print’ or ‘run’, it is likely to be because your output mode is set to nothing, spooler, or print. To change, select the setting you prefer and hit OK. For them to preview immediately after running or printing, select preview. In the older versions of Sage, you will find this option by going File –> Choose Output Mode. Occasionally, our customers log cases with the team where they can’t open certain windows within Sage 200c, because it is currently open elsewhere; even though you know that it isn’t. This happens when Sage 200c has been forced closed, such as when the computer restarts, and that particular window is still open. This creates a Disconnected Login. When this happens, Sage still believes you are working, and so creates a lock, preventing anyone else entering – including yourself. To remove the lock, you need to remove all disconnected logins. To do this, go to the little cog in the top right of the screen and select User Login Status. The window is shown below. This Menu needs to be cleared down, by selecting the user and then clicking ‘log off’ at the bottom of the window. Once the disconnected logins have been cleared, you will now be able to enter the window. If you are still working in an older version of Sage 200c, you will access this window down a slightly different route. 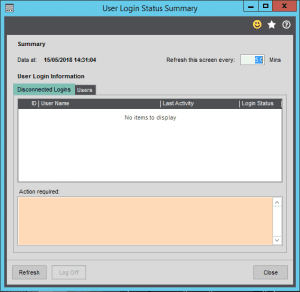 This is via Accounting System Manager –> System Utilities –> User Login Status. Customers often want to change their Year-End, or adjust periods. However, they find their close/edit/add options are greyed out. This is due to the user’s permissions within Sage. Unlike most permissions, which are granted in Sage System Administration, the accounting period’s permissions can be edited in Sage itself. To access this page, go to Accounting System Manager –> Accounting Periods –> Maintain Accounting Periods User Permissions. Once you have clicked Maintain Accounting Periods User Permissions, you will be asked to select a user. After selecting the user, you will be greeted with this window. The first permission in this window, will allow the user to Add/Amend/Delete periods. The second permission, will grant access to which modules they can edit. This is done by simply ticking the tick-boxes to either open future periods, close periods, or re-open closed periods. Click OK, and away you go. When sending out documents, it is import that you have your company details included for reference; such as your address and methods of contacting the business. Support is often queried why this information is not being printed and holds the document itself at fault. However, after jumping into Report Designer, this is not always the case. The documents are set to automatically show this information. The company details are pulled from within Accounting System Manager. 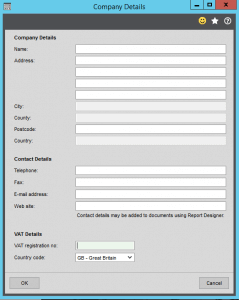 Within here, open the Settings folder, and there is a form called Company Details. If this is not complete, then the fields on the documents will be empty, as there is no information to pull through. This is also where you can make any changes to your details, such as a new number or a change of address. The form is set up like below. On a final note, if you have any amazing ideas on how to improve Sage, they would love to know. At the top right of your screen within Sage, you will see a little yellow light bulb. Here you are able to upload your ideas on how Sage can improve. Other users of the system are then able to vote for you suggestions to come alive. This is where most of the new features have come from, so it is important to make sure your thoughts are heard.